SANTA CLARA, Calif. -- From 2011 to 2013, there was no more heated NFL rivalry than the one between the San Francisco 49ers and Seattle Seahawks. The NFC West division rivals were not only two of the best teams in the league, but played a physical, punishing style of football that left opponents eagerly awaiting game's end. While there were many superstar players dotting both rosters, none better defined that rivalry than then-Seattle cornerback Richard Sherman. Which is why it's almost hard to believe that just five years later, Sherman, who once openly acknowledged that he simply blocks all 49ers fans on Twitter, is set to be a Niner. The Niners and Sherman came to terms on a three-year deal Saturday night, offering Sherman a chance to stay in the NFC West and to play his former team twice per season. 1. Let's begin at the end. Nobody knew it at the time, but the NFC championship game that followed the 2013 season would be the unofficial finale of the 49ers' three-year run of greatness and thus the end of the most intense meetings the rivalry had ever known. It ended with perhaps the biggest play of Sherman's career. With 22 seconds left and the Seahawks clinging to a six-point lead, Sherman leaped and tipped a pass from Colin Kaepernick intended for Michael Crabtree in the corner of the end zone. Seattle linebacker Malcolm Smith caught the deflected pass for an interception to ice the victory and send the Seahawks to the Super Bowl, where they would win their first championship. Smith and Sherman are now reunited in San Francisco. 2. Of course, what happened after Sherman made his acrobatic tip might be the moment that drew the most ire from 49ers fans. Moment after making that game-saving play, Sherman stopped for an interview with Fox's Erin Andrews. 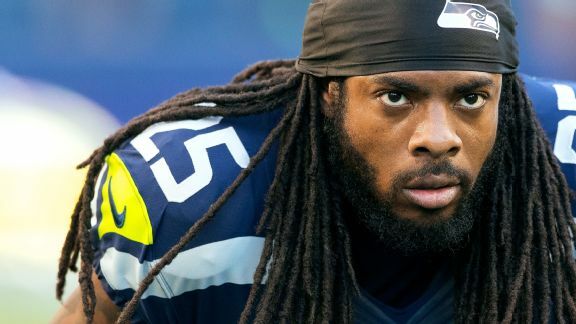 When Andrews asked Sherman to take her through the play, he went on a rambunctious rant in response to comments he said Crabtree made about him the previous offseason. "Well, I'm the best corner in the game," Sherman yelled. "When you try me with a sorry receiver like Crabtree, that's the result you're going to get. Don't you ever talk about me." He would go on to apologize the following day. Worth noting: Crabtree plays for the nearby Oakland Raiders, who are scheduled to play the 49ers at Levi's Stadium this coming season. 3. Sherman played for former Niners coach Jim Harbaugh at Stanford, but in the years after they both arrived in the NFL in 2012, Sherman made it clear he didn't have much of a relationship with his former coach. In Week 2 of the 2013 season, the Seahawks hosted the Niners in Seattle and drubbed them 29-3 on Sunday Night Football. Sherman had two tackles, an interception and shut down Niners receiver Anquan Boldin. After the game, Sherman gave Harbaugh a tap on the back as he ran off the field. Asked about it after the game, Sherman threw a little verbal jab at Harbaugh. "I told him good job, good game, but he didn't give me nothing back," Sherman said. "I guess sportsmanship doesn't go both ways." 4. Back in 2012, just as things were heating up between the teams, the Niners knocked off the Seahawks 13-6 at Candlestick Park. After that game, multiple Seahawks claimed Harbaugh honked his horn and waved at Seattle's team bus, according to what Sherman told Yahoo! Sports. In the December rematch, the Seahawks throttled the Niners 42-13 as Sherman came up with an interception and three pass breakups. After that game, Sherman said he tried to convince Seattle coach Pete Carroll to run up the score against Harbaugh as Harbaugh once had when the coaches were rivals at the college level. "I'm not gonna lie to you," Sherman said. "I told Pete, 'Let's score and go for two.' He said, 'We have more class than that.'" 5. It happened after the 49ers had faded from contention, in 2014, but we'd be remiss if we didn't acknowledge one of the stranger Sherman-Niners moments. After Sherman posted a pair of interceptions as Seattle beat the Niners 19-3 on Thanksgiving night at Levi's Stadium, NBC had set up a Thanksgiving dinner at midfield for reporter Michele Tafoya to give to the players of the game while she conducted a postgame interview. Soon, it would become the site of one of Niners fans' most haunting memories in their new stadium: Sherman and quarterback Russell Wilson chowed down on turkey legs while sitting directly on the 49ers' logo. Despite all that, it's safe to say many 49ers fans are already embracing Sherman now that he plays for their favorite team. If Sherman can return to full strength from an Achilles injury, all of his previous antics will undoubtedly become water under the bridge. For now, simply unblocking the many members of the 49ers faithful on Twitter would be an ideal olive branch for Sherman to extend.